As an alternative to removing large sums of cash from the bank, you can purchase a Cashier's Check (or "Bank" Check). Cashier's Checks are checks written from the bank, drawn on bank funds, for those times when a personal check is not acceptable. 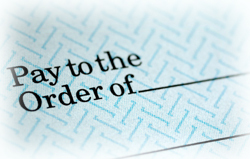 A Cashier's Check offers your recipient better assurance that the check will clear (as compared to a personal check). Cashier's Checks are only available through banks and other financial institutions for their customers, and are usually written for large amounts for special purposes. For when personal checks are not accepted. An account with great rates and convenient access.